Managing editor David Donovan reports on a shameful display of media ethics by the Fairfax Press — and an even more disturbing indictment of Australia’s failed Press Council. LET ME BE PLAIN: the Australian Press Council is a totally inadequate toothless tiger. Australia needs proper regulation of its newspapers. The Finkelstein Inquiry into Australia’s media identified this state of affairs such, and I have more clear evidence to present here that he was right. The Government must resolve this situation for the benefit of all Australians. Well, there are many problems in Australia’s media, with the massive overconcentration of ownership in the hands of a small handful of proprietors obviously being one. This situation has led to the development of an unaccountable and propagandistic press pack, as we have demonstrated on these pages countless times. Indeed, one foreign proprietor with questionable ethics – Rupert Murdoch – owns close to 70% of Australia’s press. But the other major flaw is that when this yapping press pack decide to go after an individual – to shame them, or defame them, or vilify them, often quite unfairly and without remorse – apart from the ghastly and expensive lottery of the court system, there are really few avenues for individuals to seek redress. For newspapers, the only avenue available is the Australian Press Council — a totally inadequate and poorly funded organisation, paid for by some of the newspapers publishers. I understand that until fairly recently, its offices were housed in a corner of a News Ltd building. So much for independence. Recently, an opportunity presented itself for me to conduct an experiment to see how well the Press Council reacted to a perfectly valid claim by an individual who had been unfairly and, it seems, rather maliciously defamed by Greg Hywood’s apparently “problem free” Fairfax Media, causing the lady in question significant nationwide public vilification and, as you would imagine, a great deal of distress. Not only did Fairfax refuse to apologise, indeed it engaged in an arrogant and ham-fisted attempt to obfuscate and cover-up the incident. Finally, after much frustrating toing and froing, then a complaint, the Australian Press Council proved to be utterly incapable – or perhaps unwilling – to rectify and remediate this complaint in any adequate way whatsoever. Moreover, their manner of dealing with the complaint showed they are, in fact, completely in the power of the media organisations they are supposed to be watching over. In short, it demonstrated that Australia needs a proper media regulation body, not this gormless parody of self-regulation we currently “enjoy”. Jennifer Nash has been trying to get attention to her son's plight for many years. 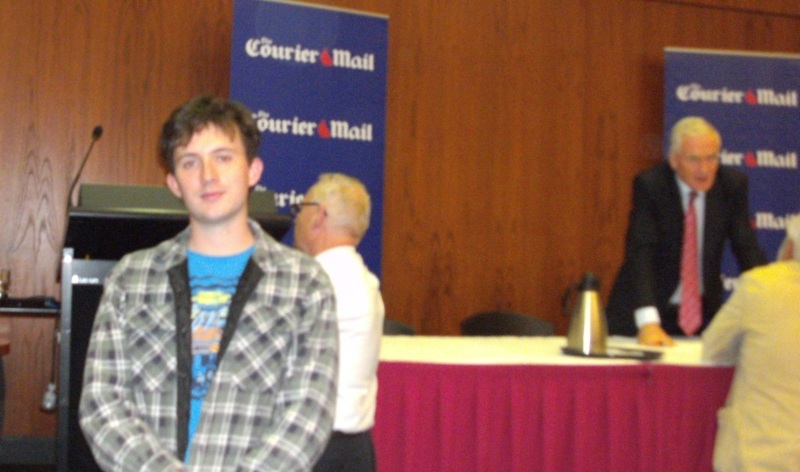 As you may recall, on 12 July 2012, I wrote about the lady who has been reported to have called Julia Gillard “white trash” at a community forum outside of Brisbane. Jennifer is well-known to long-time Independent Australia readers, as mid-last year we did a full and thorough investigation into former school bullying victim Jordan and his mother’s fight for justice, along with their rather callous treatment at the hands of the Queensland Police, justice system and Government. What they didn’t need after Tuesday night was to be on the end of further vilification and abuse through (even inadvertent) misreporting of this incident. In my view, the Brisbane Times should issue an apology and a correction to Jennifer Nash, rather than merely adjusting their website and carrying on. 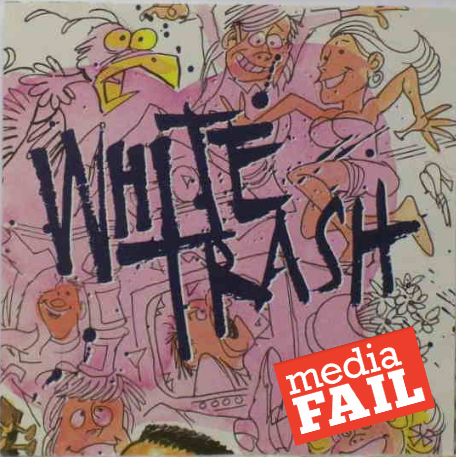 As I said, Jennifer was subject to vilification and abuse, as the fact she had apparently called the Prime Minister “white trash” was broadcast all over Australia by radio networks and other publications on the basis of this, originally, inaccurate Brisbane Times report. And there is absolutely no doubt in my mind the Brisbane Times reported that Jennifer Nash called the Prime Minister “white trash”. I read the article myself and saw these words with my very own eyes. I also noticed the change that was made later in the day — to what it is now. Not only that, I received correspondence from other people bemoaning the decline in standard in our society that someone would call our Prime Minister “white trash”, along with links to the article in question. I have been known on occasion to have been critical of Julia Gillard…during her first 12 months as PM she seemed to more often than not take one step forward and ten back…her manner of speaking drove me nuts…so monotone, so school marm. But as she grew into her role, regardless of or probably more to the point in spite of, the daily barrage of cruel derogatory comments fired at her by the mainstream journalists both male and female and the failure of those same journalists to apply critical fair and balanced analysis of Labor’s policies and the constant refusal to apply to the blowtorch to the lies and misinformation that Tony Abbott was allowed to continually perpetuate, Julia Gillard always stood tall seemingly unaffected by this abuse. I began to see this woman as the strong effective Prime Minister she was becoming – one with a vision for the country and also one not afraid to take on the big reform policy challenges. But more importantly one who could still smile and get on with the job in the face of the daily cruelty. So when I read in a morning Fairfax newspaper on July 11 that at a community cabinet meeting in Ipswich Qld, a woman in the audience had called the Prime Minister “white trash” I was outraged that in this country it had come to down to this. “The lady at the meeting who spoke against Julia Gillard (who isn't a lady) is correct. Julia Gillard is trash and the longer this Labor government leaves Gillard in the "leadership", the worse it's going to be for all Labor MPs at the next federal election." 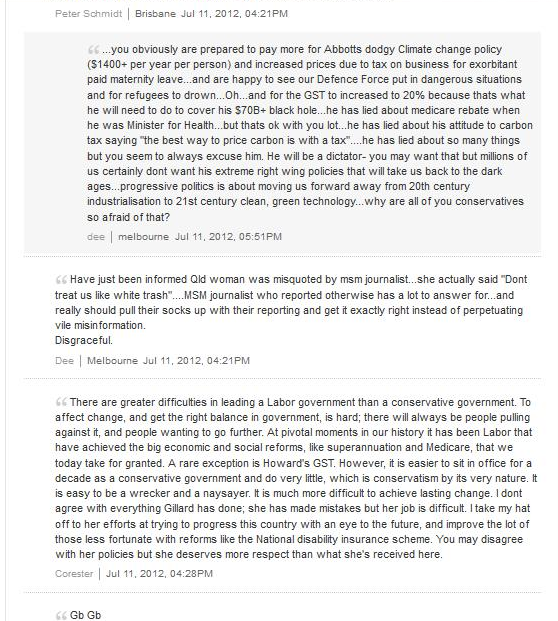 That response could only have been in reply to the story that was written by Bridie Jabour in the morning Fairfax press that I read and no doubt thousands of others read that clearly stated that the woman in question called the PM “white trash”. The post by “Sharon” began a snowball of derogatory comments about the PM that showed the depth of viciousness and nastiness conservative supporters will stoop to in order to denigrate the PM. It was vile. However, by mid-afternoon I become aware that the comment made by the woman, Jennifer Nash, at the meeting – was reported incorrectly. Mrs Nash did not call the PM “white trash”. In frustration over the years of bullying her son had endured at a Qld school and the lack of support from within the system, Mrs Nash tried to be heard and called out “We are not white trash” — referring to herself and her son. At 4.30pm I posted on the comment page that this was the case but very much doubted that the moderators would print my comment. I was pleasantly surprised that they did and posted again to thank them for doing so and cited the link to the correct story. I was even more surprised to find as I checked the story and comments later that evening that the actual original story by Bridie Jabour had been changed to reflect what really happened at the Community Cabinet. Fairfax have denied they changed the original story. But one only has to read the first comment by “Sharon” …”the lady is right” “Julia Gillard is trash” to know that had the second story been the one written in the morning, I very much doubt it would have prompted “Sharon’s” comments agreeing with what was supposed to have been said. Seems it is easier to alter a story online than it is to admit fault and apologise for sloppy incorrect reporting. There surely can be no doubt that the original article said Jennifer Nash called Julia Gillard white trash and, what’s more, that Fairfax did not correct the story for some hours after the original publication. A simple Google search along the lines of “lady calls Gillard white trash” can confirm this beyond a shadow of a doubt, since many people commented on the original article in social media and blogs, etc. Indeed, Jennifer Nash was subsequently contacted by 4BC who wanted to speak to the lady who had called Julia Gillard “white trash” and she did interviews to correct the record. Your initial article was wrong and claimed I called PM Gillard ‘white trash’ and that was picked up by other media and widely misreported. Many hours after the initial report was published, after someone put a comment after your story correcting the record, you belatedly corrected the story. By then, of course, the damage was done. What the Brisbane Times didn’t do and should have done was issue an apology and make an annotation in the story stating clearly what was initially reported and why it was wrong. This, and your perfunctory reply to my complaint, shows your organisation practices extremely unethical journalism. The incident led me to be publicly vilified, caused me great hurt and significant mental distress. As a result I am considering a formal complaint to the Press Council and other legal options open to me, including defamation. The real story here was in fact my son Jordan’s address to the PM on the very serious documented and corroborated judicial corruption and torture of Jordan in parliament, false arrest and imprisonment, followed by false prosecution which was all suppressed. Rather than reporting these pertinent facts and allowing the public to read about these very important issues, your publication chose to focus on me, misreport my comments and allow me to be publicly vilified, before whitewashing the incident later with a sneaky correction of the incorrect quote. Once, again I demand a prominent correction and a public apology from Brisbane Times or I will be considering my options. Jordan Nash at another community forum. I have been forwarded your complaint regarding allegations that our website misrepresented your quotes to Prime Minister Julia Gillard in Ipswich. I do not believe our website published a story saying this. In fact, if you see the email trail below, we were proactive in alerting Fairfax websites nationally to the fact that Sunrise had the story wrong and advising them to not publish anything along those lines. We were, however, working on a story quoting Sunrise before realising their error and halting its publication. It is my belief this story never saw the light of day. If, however, you have evidence that this story was published in error, please forward it to me and I would be happy to issue a correction. I should say, though, that I know for a fact that if this did get published, it would have been up a mere matter of minutes, until our revised story was published, not hours as you allege in your letter. According to Conal Hanna, the email trail, which he forwarded to Jennifer, suggests the Brisbane Times was “proactive” in preventing the wrong story being reported. Of course, he does leave the door open for suggesting the incorrect allegation may have been published, but only for mere minutes not hours. In fact, it shows one of the journalists suggested "beefing up" Bridie Jabour's story to include the "white trash" comments. It seems that this was done. 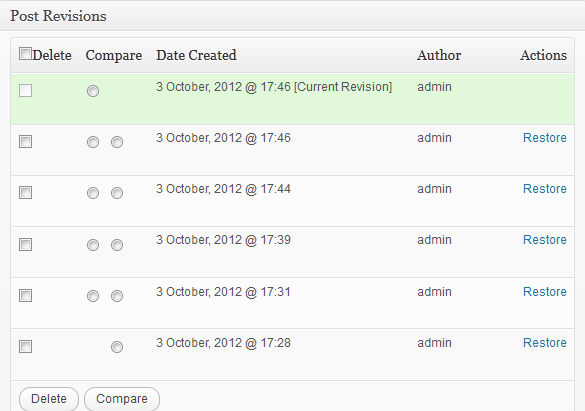 I can go back and find out exactly when I revised any story, what it said before and what it said after. Even if Fairfax live in the dark age, and a revisions report such as this is not immediately available, nothing can be truly deleted from the internet. All Hanna needed to do was ask his IT people to check the webserver logs to find out when that story was changed and what the changes were. The fact Hanna didn’t ask for this to be done is extremely telling — he either didn’t want to find out the truth, or he knew the truth and was fudging. The fact that some comments exist that demonstrate that the original story said Jennifer Nash called Julia Gillard “white trash” were later quietly deleted indicates that it is quite likely Conal Hanna knew exactly what had gone on. Furthermore, even if the incorrect statement had been published for minutes, as Hanna suggests was possible, he should have issued a correction and apology. Hanna had every reason to look for the truth, but wouldn’t. All in all, it shows profoundly poor media ethics and editorial judgement. You are mistaken and I have several people who will support me in my assertion and attest that it remained up for several hours. I also have email and facebook messages with times. Your stance is very disappointing, particularly as you had my contact details including my phone no and could have telephoned me to check before you released your news report, or you could have replayed the broadcast. It was only in the afternoon well after 4 pm following a post by a blogger, who put the record straight confirming I had not called the PM ‘white trash’ that the report was in fact amended. Hanna’s reply was utterly dismissive, even mocking Jennifer by the suggestion she was referring to an entirely different report — something obviously not the case. As I said, I believe you are mistaken. If you are able to provide me with evidence to the contrary, I will happily issue a correction. But I read our story at 9.30 in the morning and it specifically said that you had said ‘we are not white trash’ as detailed in the email trail below. Unless you are talking about a different story of which I’m not aware. Again, I’d need to see some indication of what specific report you are referring to. 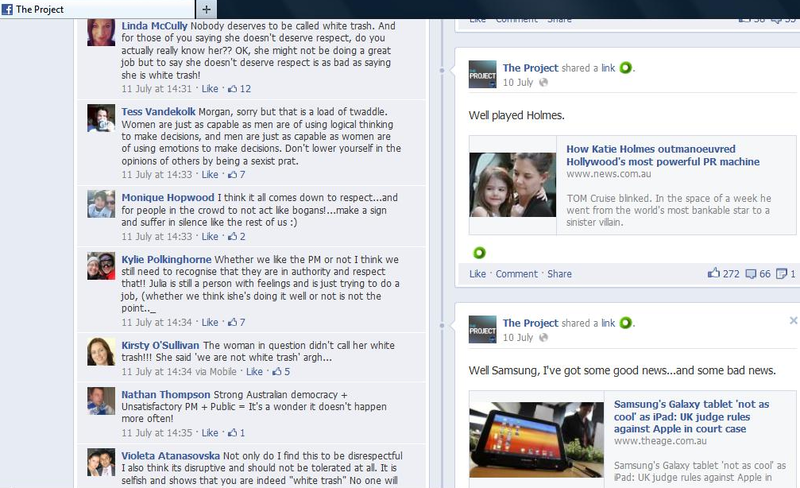 Attached are 2 screen shots of comments, which show the story only changed in the late afternoon. The simplest and quickest way would have been for you to check your IT records as to when the story was amended when I first contacted BT — then you could have verified this for yourself. Your continued obfuscation and evasion, when the facts are clearly available to you, does your organisation no credit. In fact, when I spoke to 4BC early on 11 July morning, they already knew I had not called the PM white trash or any other names. Why didn't Brisbane Times know this too by the time the incorrect story was published at 8:21 am, which was half a day after the previous night's forum? Brisbane Times should make a prominent correction and an apology, giving it the same prominence and attention the original story was given, no matter how long the incorrect info was up for. Clearly the wrong initial story was that was used by numerous other media sources to vilify us. I find your stance and unwillingness to cooperate very disappointing. I had hoped that BT would want to do the right thing by Jordan, by me and also by your other readers — who deserve to be properly informed and alerted to the fact I was badly misrepresented. I am not willing to engage in further correspondence on this if you are unwilling to rectify this properly, professionally and ethically as it is unreasonable and exhausting. The facts are clear here. I will make a formal complaint to the Press Council later today and take other action as I see necessary. Can you please clarify this last email. Are you complaining that our news story misreported the facts, or that the reader comments on the story were incorrect? Not content to merely ignore Jennifer’s complaint, after holding her up for public vilification through its shoddy reporting, then denying it, refusing to investigate it and trying to cover their tracks, Conal Hanna went further to slyly ridicule Jennifer’s complaint. Disgraceful. In any case, after exhausting that fruitless dead-end, and being ridiculed in the process, Jennifer was left with no option but to take up her complaint with that most fearsome of beasts, the Australian Press Council. Comments on The Project website. I should mention that Jennifer Nash did not want to make the complaint to the Press Council, because after being verballed by Australia’s mainstream press before, she had previously complained to the APC. She says the experience was traumatic, as they stone-walled her, asked for absurd amounts of detail and then eventually did nothing to repair the damage. She just didn’t want to put up with this frustration, but I convinced her to do it anyway, for the greater good. I did this not because I expected the APC to do anything about her complaint, but rather because I knew that her complaint had substance and I wanted to see just how they would railroad her this time, as I rightly suspected they would. I apologise to Jennifer for putting her through this to prove what we already knew— that the Australian Press Council is totally powerless, impotent and whose only use is to provide a superficial fig-leaf of respectability for our totally unaccountable press. It should be noted that Jennifer had diligently copied the Press Council into all the correspondence she had engaged in with the Brisbane Times, so they should have been fully aware of all the facts. Indeed, it could be argued that a well-functioning Press Complaints body would have been following the issue up with Jennifer directly, well before she needed to make a formal complaint. This, of course, didn’t happen. Jennifer Nash received the following response from the APC’s “Director of Complaints”, Paul Nangle, who gave the Press Council a convenient way out by asking specifically for the article he should have known from the correspondence Jennifer Nash could not provide, because it had already been sneakily changed by Fairfax (which was, in fact, part of the complaint). I refer to your Australian Press Council complaint received on 26 July 2012. “Julia Gillard has been called ‘white trash’ by an aggressive heckler during a community forum in Brisbane. It would be appreciated if you could respond to this email by 13 August 2012. You are welcome to contact me directly if you would like to discuss this further. I did not keep a copy of the original article, but several people are prepared to support my assertion and, further, the changes to the article should be available through Brisbane Times IT system. Please copy David Donovan editor@independentaustralia.net and Denise Allen denniallen@yahoo.com.au both highly credible witnesses, I would have thought. On the 14th of August, Jennifer telephoned Paul Nangle to follow up; of course, he had no good news for Jennifer. He said he had contacted Brisbane Times, who had outright denied any article of their had ever said Jennifer had called the PM white trash. And to show what a toothless tiger the APC is, he told Jennifer that he did not have the power to force Fairfax to hand over their records. Re: Brisbane Times article “Gillard grilled and heckled at community cabinet”. I acknowledge receipt of your complaint received on 26 July 2012. You have stated that the Brisbane Times article incorrectly reported that “Julia Gillard has been called ‘white trash’ by an aggressive heckler during a community forum in Brisbane”. You state that these words were attributed to you. You also state that the Brisbane Times subsequently altered the article but did not apologise for its mistake. As discussed in our telephone conversation on 14 August 2012, I have not been able to locate a copy of the article which is the focus of your complaint. 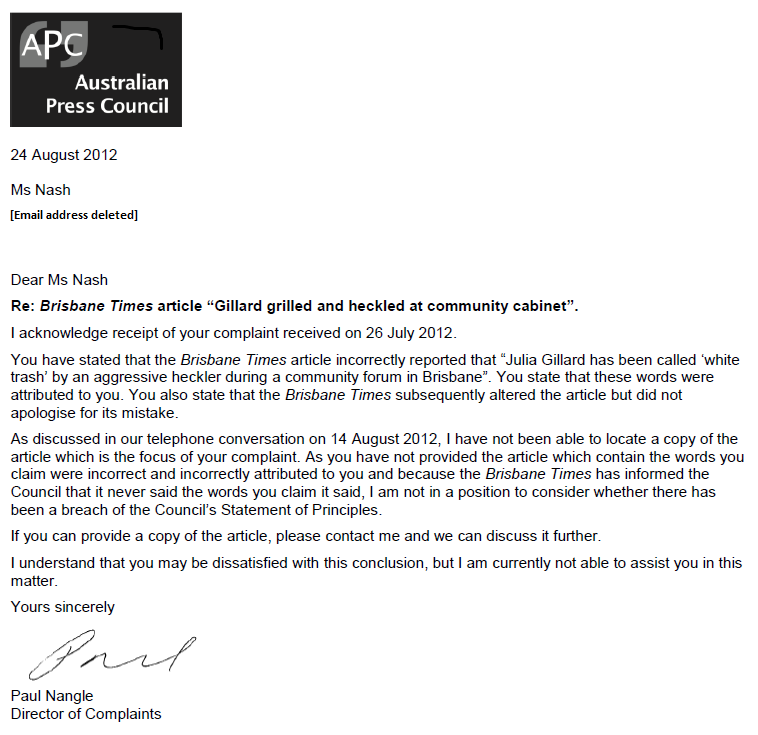 As you have not provided the article which contain the words you claim were incorrect and incorrectly attributed to you and because the Brisbane Times has informed the Council that it never said the words you claim it said, I am not in a position to consider whether there has been a breach of the Council’s Statement of Principles. If you can provide a copy of the article, please contact me and we can discuss it further. I understand that you may be dissatisfied with this conclusion, but I am currently not able to assist you in this matter. Australia’s press pack will tell you that there is nothing wrong with the Australian media ethics. Anyone who has been reading IA or watching ABC Media Watch for any length of time knows that this is simply not true. This story further demonstrates how our media can run roughshod over individuals they deem irrelevant or insignificant. Ideally, Australia needs a full and comprehensive Leveson style Inquiry to root out the corruption in our press, but failing that, a proper independent regulator that isn’t completely compromised by the organisations paying its bills would be an important start. The current system doesn’t work — and it demonstrably doesn’t, as we have seen in this story.